distinctive ridged appearance once the thatch tiles has been installed. "Cape thatch tiles can provide an authentic thatch look for less than a real thatch roof, they are versatile and easy to install." With a life expectancy of about 6 to 10 years, cape thatch tiles would also require fire retardant treatment every two years. Moulded into a polyurethane base, the Cape reed used is completely solid, rather than hollow as is normal thatching grass, ensuring that no pieces can be pulled out. 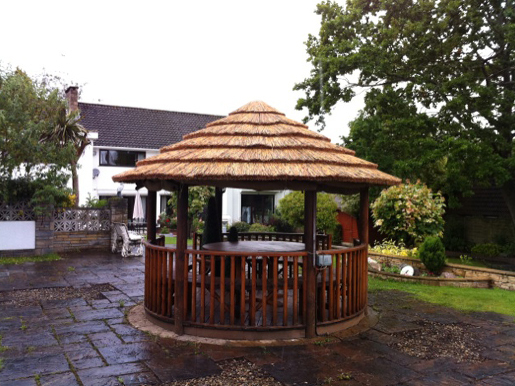 The thatch tiles can be fixed onto existing roof structures, bringing a whole new look to your outside space or can even be used indoors to create a thatched bar area.